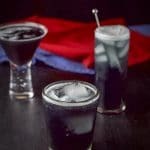 This purple rain cocktail recipe is pretty and super tasty! The blend of flavors are perfect and the color is fun! You’ll feel cool drinking it! Ask Christopher. He could tell you. I lost one of my sisters to breast cancer over a decade ago. I can’t believe it has been that long. Nancy was 41 at the time of her death and not a day goes by that I don’t think of her. The reason I bring this up now is not only did she love the color purple, she also would have LOVED this cocktail. I never had a chance to make it for her. So, this post is for her! Oh, and for Prince, too. Get your cocktail shaker and fill it halfway with ice. 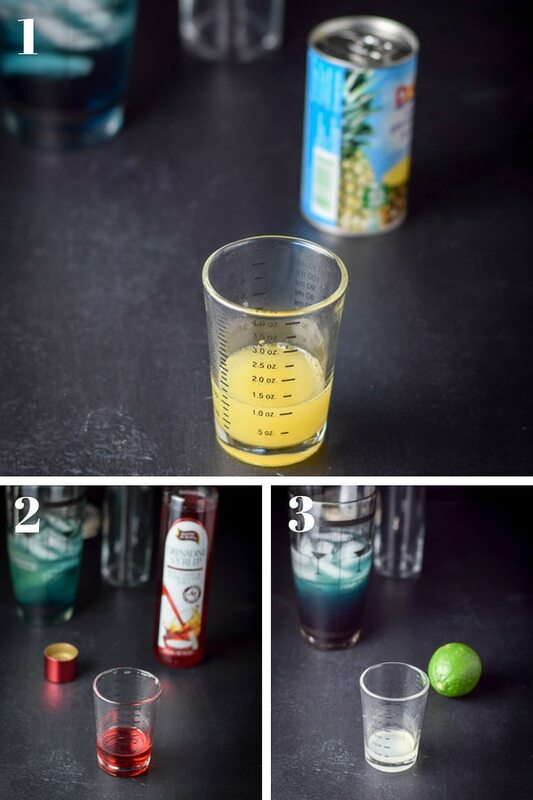 After measuring out the ingredients, pour them into the shaker. 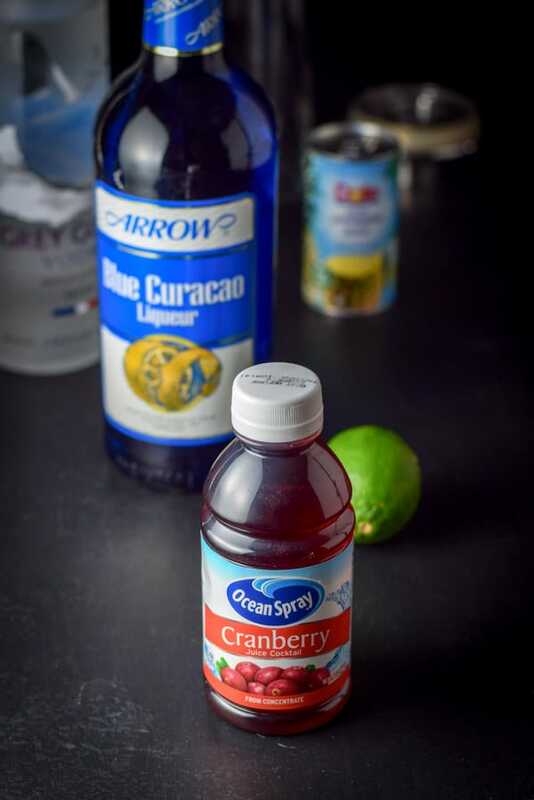 Gather the ingredients – vodka, blue Curacao, cranberry juice, pineapple juice and lime. The color of the cocktail is now becoming more purple. Cap the shaker and shake for 30 seconds. Add extra ice cubes in the glass and pour the contents in a Tom Collins glass. 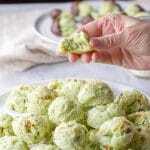 See the recipe card below for two variations to this recipe. I’ve pictured the three different ways I’ve mixed the Purple Rain. The front cocktail in the tall glass is the main recipe below. Look at the deep purple color. YUM!! 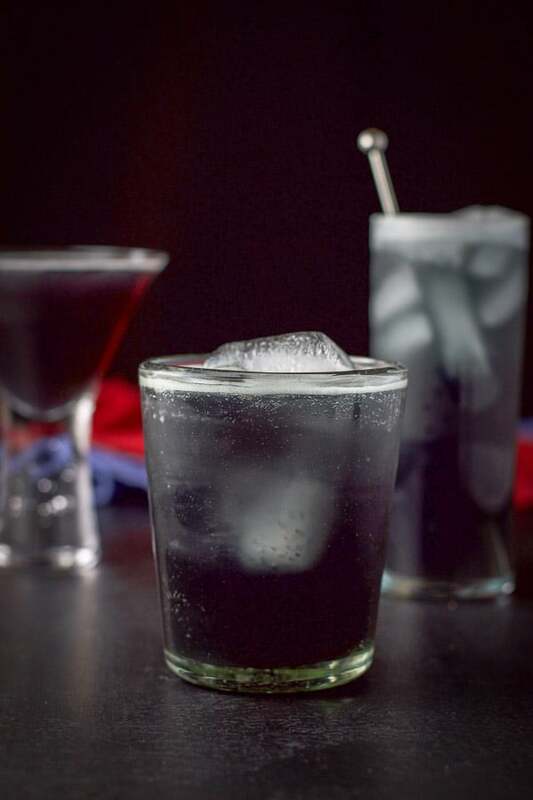 Notice that by the ice cubes the cocktail looks almost teal, but below the cubes, it’s a nice deep purple. 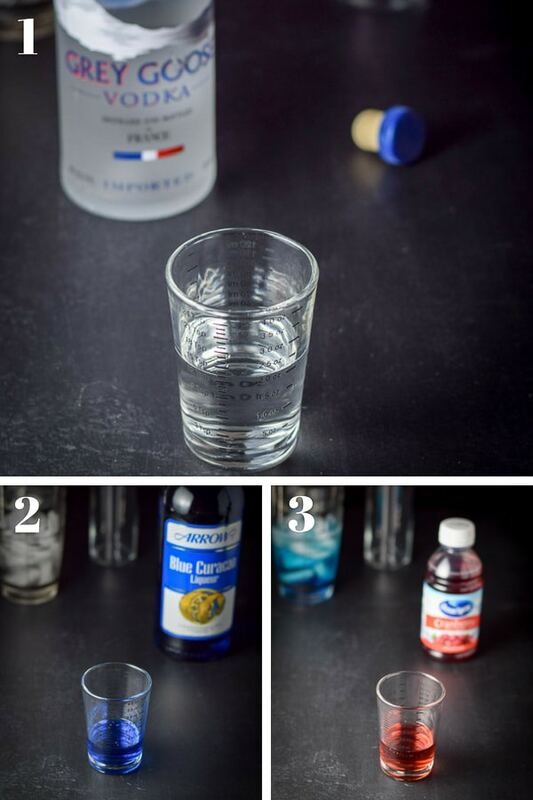 For a deeper purple color pictured in the double old fashioned glass below, use a full ounce of grenadine, as I call for in the two variations below. This third variation, pictured in the martini glass, looks almost black. That’s because I left out the lime juice. I wanted to see if there was a taste difference. There is but it’s so slight, you probably won’t miss it. Which one of these purple rain cocktail variations do I prefer? I can’t play favorites! They are my “babies”! 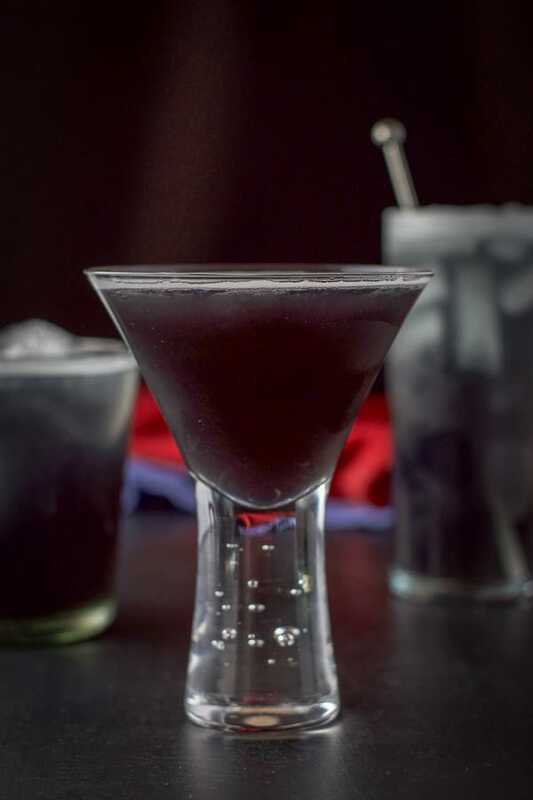 If you’ve tried this purple rain cocktail or any other recipe on the blog, I’d love the hear what you thought about it in the comments below. I love hearing from you! You can also FOLLOW ME on FACEBOOK, TWITTER, INSTAGRAM and PINTEREST to see more of my delicious food and delightful cocktails! 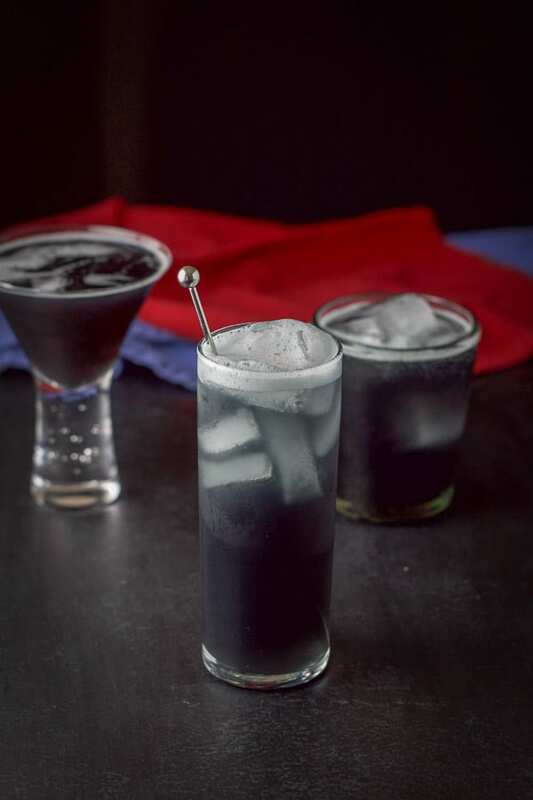 This deep purple cocktail is truly delicious. 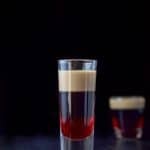 The recipe below is the one in the tall glass. The other two variations are in the notes section. 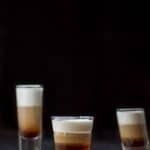 *This recipe was originally published June 3, 2016. All process shots are from the original post. My friend used to love Prince! 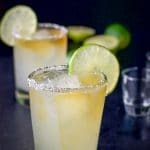 Fun cocktail! what a great cocktail! the colour is beautiful love it! Thanks Georgie! And it’s really tasty! What a beautiful cocktail and it uses absolutely all of my favorites! Thanks Ginny! I appreciate your comment! Love the color and I bet it tastes delicious too. 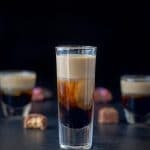 Also gorgeous photos of the drinks! Oh, purple cocktail looks mysterious! I love your instructions 5-9, haha! Cheers! Doesn’t it Alina? And hehe. Thanks! Cheers! Hehe. Wheels are turning in the head! Great drink. I work at an Elks Lodge this was something very different for everyone. They have to get out the box this drink did it. Thank you for the recipe. How fun, Denise! I’m glad you/they liked it. It was one of my sister’s favorites!